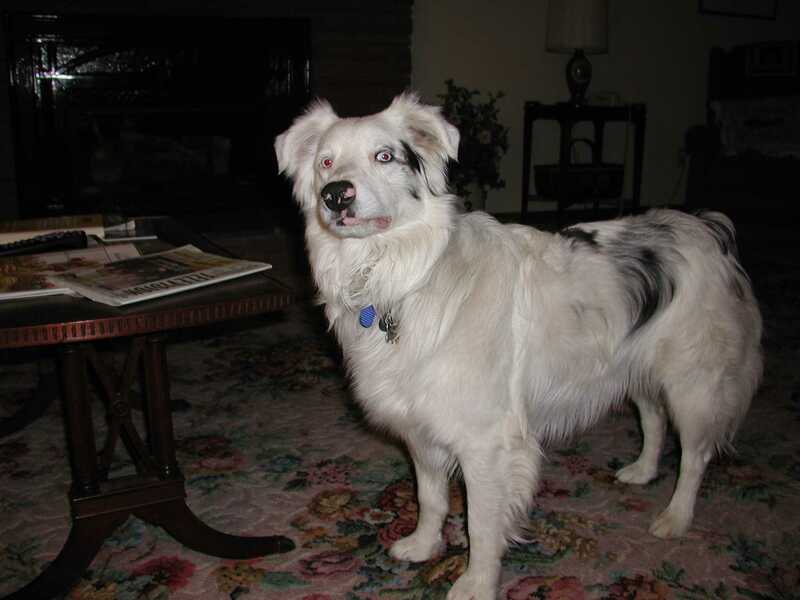 Deaf dog: Blanca is an Australian Shepherd puppy who was born deaf. She can already fetch the newspaper, and play ball and frisbee. She's a smart one. Other pets: a Border Collie and a guinea pig. Deaf dog: We just adopted Bingo, a 9 month old English Setter, from the local Humane Society. He is a warm, loving addition to our home. His former owner bought him as a hunting dog, but when he found Bingo to be deaf dropped him at the Humane Society, much to our good fortune. We would appreciate hearing from other's with a deaf dog as we are totally new to this area and will gladly accept advise. Other pets: One cat named Caroline. 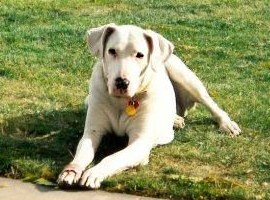 Deaf dog: Angel is a 2 to 3 year old Great Dane. Her family says "Angel is a rescue from a previous rescue home. She is extremely loving and even lets my 2 year old sit on her back. She may be deaf, but she has a loud bark and a happy disposition. She cowers at times due to previous abuse, but all in all she's a very stable and well adjusted dog. She loves her new buddy Huggers (black Lab/Dane mix)." 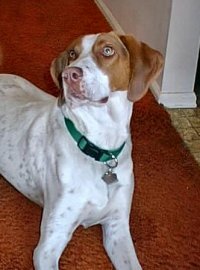 Deaf dog: Annie is a 4 year old Brittany/Walker Hound mix. "Annie is very sweet and thinks everyone is her friend, including all other dogs and cats. She has a gentle spirit but is clumsy and thinks 75 lbs is not too big for a lap dog. None of myths about deaf dogs is true with Annie. She could not be a better dog even if she could hear." Other pets: Lucy, a 9 year old Brittany/Springer mix and Martina, a 14 year old cat. Deaf dog: Kai is a 10 year old Coyote/Chow/Heeler mix. " I found Kai running down the road to my house, and wasn't sure why she wouldn't come when I called her - now I know! Apparently everyone thought she was wild and hadn't tried to help her, and she was skin and bones when I picked her up. After being at Animal Control for 5 days, no one claimed her, so she came back home with me - my 6th! She was unresponsive when I first picked her up, but right away we bonded, and now she is my little shadow, wanting to be petted constantly, always eager to please, and showing more love than I've ever seen in a dog. Especially an abused, abandoned one. We believe her deafness may have been caused by abuse, but she's learning her signs fast." Human companions: Vanessa Johns, her father Kimbrough, mother Karla and brother Daniel. Other pets: Daisy, 13 year old Bichon; Jesse, 4 year old Husky/Shepherd; Tucker, 3 year old Aussie; Shiloh, 3 year old Aussie; Buck, 3 year old Wolf/Malamute; and lots of birds and reptiles. Deaf dog: Mo, short for Modigliani, is a 4 year old Boston Terrier. "Mo was brought to the vets at six weeks old to be euthanized because his owners wanted their son to have a dog that was "normal". I worked at the vets and couldn't stand the thought of that happening to such a little defenseless guy so I asked if I could take him home and they said yes...it was the best thing that ever happened to me! He is the smartest, cleanest, kindest pet I have ever had. He is funny, and cute and quite a comfort when you are feeling down. No one has ever suspected his deafness unless we tell them! Mo is awesome and I wish that I had two more like him!" Deaf dog: Ozzie is a one year old Australian Cattle dog. "We got him from the Humane Society at 3 months. He is very smart and loving. He is the easiest dog we have ever had to train. We live on 40 acres and he loves to run and play and herd our horses, thanks to our neighbor's red heeler named Josie. She watches and protects him from getting too far away." 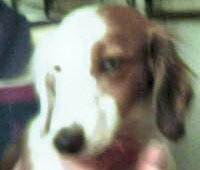 Other pets: Johnny, 8 year old Dachshund; Frankie, 5 year old Dachshund;, Willie, 3 year old Dachshund; Thumbs, 2 year cat; and 2 horses, Nipper and Virgil. Deaf dog: Panda is a 7-1/2 week old Australian Shepherd. Other pets: Zeke & Raider, Aussies; Abby, a cat; Troubles & Tarzan, Water dragons; Skinky, Monkey-tail skink; Sweety, a turtle; and Roo & Puddles-bunnies. 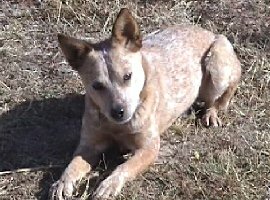 Deaf dog: Zip is a 2 year old Australian Cattle Dog. "I found Zip running the roads around our house. He's only 27 pounds of very active, very intensely loyal and possessive, very fast and athletic dog. He wants to push out all the other dogs which creates some tension but we are adjusting. If I could possibly find a home for him with no other dogs in a perfect situation I might. But he is very alert and visual and knows a lot of sign language. Thinking of doing UKC obedience with him." Human companions: Louise & Henry Vasquez, and sons Daniel & Nat. Other pets: 2 other Cattle Dogs, 1 Sheltie, 1 Basenji, 2 barn cats, and 4 horses. 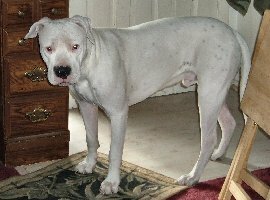 Deaf dog: Duke is a 5 month old Dogo Argentino. "Duke is a rare breed. I had him flown to me from Miami by his breeder. He will be a big boy and my husband and I love him to death! I found him on the Deaf Dogs Website, listed as Baby Doe." Other pets: A white Boxer, an Aussie/Greyhound mix, 2 Chihuahuas, 4 cats, a lovebird, and a ferret. Deaf dogs: Maggie and Mollie are 8 month old Australian Shepherd/Border Collie mixes. "We were looking for a pet for my daughter and granddaughter when we found these two cute girls on Petfinder. On a Friday in late February we drove to a private rescue north of Denver. When we got there we couldn't decide which pup to take, so we ended up with two. It was a couple of weeks before we realized they were deaf, but they had already won our hearts, so we are all learning to sign together, even our 3 year old granddaughter. We would not trade them for any amount of money! They are two of the kindest, sweetest dogs I have ever owned." Human companions: Robin and Michael Reid, daughter, Amanda and granddaughter, Bailey Bug. Deaf dog: Wally is a 2 year old Dachshund. "Wally was born from one of our litters. Wally is a piebald who was born deaf. He is a real troublemaker but we love him to death. This summer he almost drowned in our above the ground swimming pool. He made so much noise the neighbor had to summon the Humane Society to rescue him. He is quite a handful." Other pets: Yogi, Reggie, Freddy, Heidi, Dachshunds; and 3 cats.